Multilingual online magazine BIGRUSSIA (Business Investment Guide to RUSSIA) conducted a survey of heads of foreign chambers of commerce and industry, associations and associations of foreign entrepreneurs, as well as consulting agencies that conduct business in Russia. The result was a list of the most attractive from the point of view of doing business in Russian regions, in which the Chukotka Autonomous Region took the ninth place, reports IA Chukotka. Posted in News on 17.05.2017 by admin. Last Saturday, individual entrepreneur Natalia Makatrova, who has been working in the trade sector for a long time, presented a greenhouse complex to the heads of districts and city districts of Chukotka, where the starting entrepreneur Pavel Makatrov launched his business of growing vegetables and greenery. 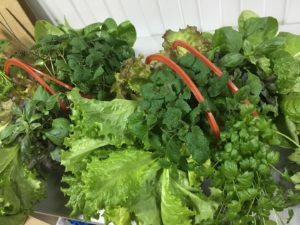 Nowadays practically in all outlets of the city of Anadyr you can see fresh greens in “pots”, grown in a greenhouse complex of a beginner entrepreneur. Already come on sale the first seedlings of various colors. The preparation of the documentation for the project was assisted by the Chukotka Development Fund. Free assistance was provided in processing documents for obtaining the status of the resident of the TOR “Beringovsky”. At the same time, an application was formed to receive state support to the Department of Finance, Economics and Property Relations of the Chukotka Autonomous Region. Participation of the project in the TOR “Beringovky” will allow to receive tax privileges and other preferences stipulated by the legislation. Grant state support will be provided on the basis of competitive selection by the Department of Finance of the economy of property relations of the Chukotka Autonomous Region in monetary terms for the development of the beginning production. These measures will increase the profitability of production, make investments at the expense of profits in the expansion of sown areas, as well as to please the inhabitants of the district in the future with tomatoes and cucumbers of high quality. Financial support for the project as a whole, on loyal terms, was implemented by the long-standing and reliable partner of the entrepreneur – the branch of PJSC “Asia-Pacific Bank” in Anadyr. “Each object is a business project of enterprising entrepreneurs. It is difficult to pull such costs out of the municipal, county or federal budget. We tried to show the positive experience of interaction between the authorities and entrepreneurs, which is useful to everyone and ultimately affects the socio-economic status of people living in our territory, “the mayor of the city of Anadyr, Ilya Davidenko, told about his choice of facilities for showing colleagues. “We express boundless gratitude on behalf of the Chukotka Development Fund to Natalia Makatrova for her willingness to share her experience with start-up entrepreneurs and an active life position in the development of new directions for the benefit of the inhabitants of the region. This project is a clear indicator of the application of a variety of opportunities for the development of new entrepreneurship. We are ready to scale the experience gained and support constructive initiatives, “said Olga Plotnikova, director of the Chukotka Development Fund. 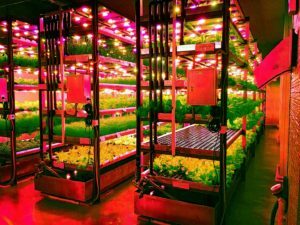 It is noteworthy that the greenhouse business has recently become more attractive – new enterprises for growing greenery and vegetables are planning to open in the district capital, in Pevek, in Anadyrsky district and on the territory of Providensky urban district. While the development of this industry is hampered by high energy tariffs, but at the federal level a decision has already been taken to reduce them for the industry of the Far East. Posted in News on 15.05.2017 by admin. In March, the Individual Entrepreneur for Consultative Aid for the Construction Project for a year-round industrial greenhouse in the village of Vaegi addressed the Chukotka Development Fund. The Fund provided advisory assistance, as well as a business plan, which the individual entrepreneur managed to find an investor for the project. Under the project, it is planned to build a year-round industrial greenhouse in the village of Vaegi with an area of 250 square meters for growing vegetables. The aim of the project is to provide residents of the village of Vaegi and nearby settlements with fresh agricultural products – cucumbers, tomatoes, zucchini, greens. Depending on the demand, the choice of crops for cultivation can vary. Prices and quality of products will constitute a significant competition for imported air transport of vegetables and greens. 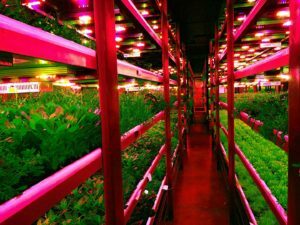 In favor of this project says the lack of a competitive environment – in the village there are no industrial greenhouses. In summer, part of the population grows vegetables for personal use in their own greenhouses. 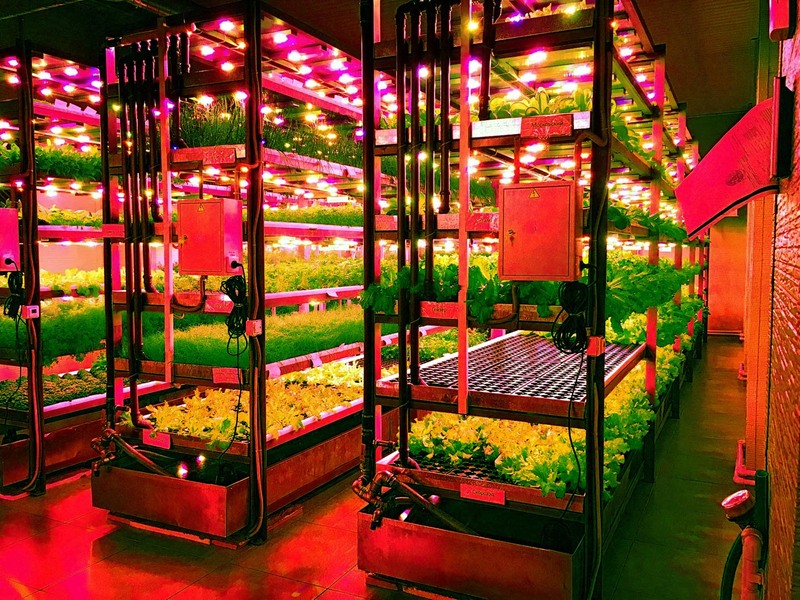 The problem of deficit of fresh vegetables exists since the closing of the greenhouse farm. Trade enterprises and entrepreneurs are very reluctant to bring this type of products to villages, especially in winter. This is due to the risk of loss of consumer quality of goods due to a short period of storage, territorial distance from district centers and the complexity of logistics. With prolonged transportation, vegetables become less suitable for consumption. The transport scheme is complex and multistage, as well as high cost. In the first year of the project, it is planned to attract two employees. The total estimated investment volume is 2 377 thousand rubles. The total estimated volume of capital investments is 1,975 thousand rubles. The payback period of the project is 1.9 years. On average, the profitability of the project will be 55%. Posted in News on 11.05.2017 by admin. For the effective implementation of any investment project or business idea, it is important to correctly draw up a phased implementation plan, which raises a lot of questions. When to register a company - before or after compiling a business plan and assessing its effectiveness? How to attract the most suitable loan and when - before or after the initial investment in your business? How to get the maximum tax benefits and state support? When to become a resident of the priority development area (PDA) - before or after making purchases under the investment project? How to achieve the highest profitability of the project? The Fund for the Development of the Chukotka Autonomous Region will be able to help with the answers to all these important questions. At the first meeting during the negotiations, the Fund's employees identify the needs of the initiator of the investment project and help determine the optimal sequence of actions for its successful implementation. For the year of the Fund’s work, the overall positive dynamics of the implementation of investment projects in the territory of the region by business entities of various sizes: large, medium and small businesses. On average, the amount of declared investments made by residents in the first 3-5 years of the investment project implementation is comparable to the amount of savings due to the received tax benefits for 10 years. Let us dwell on this point in more detail: for example, the estimated investments will amount to 1 million rubles in the first three years of business, the tax payments without benefits will amount to 2 million rubles in the next 10 years. In the event that an enterprise or an individual entrepreneur is given the status of a TOR resident, its deductions will be preferential and will not be equal to the standard 2 million rubles, but only 1 million rubles. At the same time, it should be noted that business invests in its own development and does not pay any commissions for registration of the resident. The project for the extraction of coal in the amount of 6.5 billion rubles. With a payback period of 8 years – the profitability of the project subject to the application of the above benefits is 20.8%, and the budget efficiency (in other words, savings) due to tax preferences is about 52% of the standard tax deductions for the first 10 years of the project. The project for the extraction of gold in the amount of 15.5 million rubles. With a payback period of 2.3 years – project profitability is 17.9%, and budgetary savings for the first 10 years are about 52%. The project for the extraction and production of gold-silver alloy for the amount of 2.5 billion rubles. With a payback period of 5 years – project profitability of 24%, and budgetary savings in the application of preferences reaches 67% of all tax standard deductions. The fish processing project for the amount of 0.5 million rubles. With a payback period of 2 months – the profitability of the project relative to the committed investments is more than 1000%, budget efficiency is 48%. The first two projects, cited in this article as an example, have in themselves a nearly complete cycle of production up to the transport component, but only for the permissible activities carried out within the PDA. use by small and medium-sized businesses of guarantees from the SME Corporation or the Chukotka Development Fund as a low-cost RGOs that solve the traditional question of finding a liquid collateral for bank loans. The tax privileges for the two zones have been adopted – PDA “Beringovsky” and the free port of Vladivostok (in the part of the city district of Pevek). Tax benefits are provided in terms of income tax, property tax, land tax, MET. It is possible to apply a lowering factor for the lease of land. The greatest benefit from preferences in the PDA “Beringovsky” regime is accounted for by subsoil users at the expense of mineral extraction tax exemption. In Vladivostok free port mode, there is an exception for using privileges for enterprises engaged in extraction of precious metal ores and sands (gold, silver and platinum group metals) – this type of activity is not supported by privileges. The contributions to budgetary and extra-budgetary funds have been reduced by more than three times from the amount of remuneration to the personnel of the enterprise due to benefits, which gives a big saving for projects in the sphere of production (large or small) or the sphere of rendering services with a significant share of hired personnel. Also, residents can take advantage of customs privileges, apply a simplified procedure for VAT refunds, they apply a shorter period of scheduled and unscheduled inspections, which is relevant for the activities of energy, education, IT-technologies, agriculture, food production, transport and logistics and other areas. It is important to note active participation in supporting investments by commercial banks. Starting business in the implementation of an investment project can attract preferential financing at rates significantly below the generally accepted ones. For its part, the Fund is ready to assist in drawing up a guarantee for small business entities from the SME Development Corporation or to issue in the near future its own surety in return for a more expensive collateral in the preparation of the collateral. We draw attention to the permissible types of activity – the exception is the production and sale of excisable goods, trade, gambling, construction for the purpose of selling real estate, etc. Other activities related to production, domestic or transport services are welcomed and supported by the legal regime of the territory of advanced development. To date, the Fund has several projects in the preparation of business plans, including in the production of food, crop production, water treatment, provision of household services. The work of the Fund in 2017 is represented by five directions. Making business ideas for investor search. Appeal of a potential investor or a project initiator is possible through several communication channels – personally, in writing, through the Fund’s website www.fond87.ru or by phone 6-93-32. Appeals sent by investors through the structures of the Chukotka AO government are redirected to the Fund to consolidate information on the planned project, and further the Fund selects the optimal set of free services for a particular investor, accompanies it at the drafting stage and continues to accompany it at the implementation stage. Proposals for changes to the law on territories of priority development were made by the head of Minskvostokrazvitiya Alexander Galushka at a meeting on preliminary results of work on creating a PDA in 2015-2017, RIA VladNews reports with reference to the ministry's press service. One of the changes will affect the performance indicators of the territories of advanced development. The head of the Minsk region presented three such indicators for discussion. The first is related to the ratio of private and budget investments in the project. – To date, we are guided by these indicators. Therefore, there is a proposal to consolidate them at the level of the government’s act. To approve that for one budget ruble, which is invested in the creation of the infrastructure of the PDA, at least three rubles of private investment should be attracted, “said Galushka. The minister noted that the relevant precedent was created for investment projects receiving targeted infrastructure support from the state. The second indicator of the effectiveness of the PDA relates to the cost for the budget of creating one workplace. The third indicator is the amount of added value that investors create for one budgeted ruble of investments in infrastructure. This indicator was proposed by the Ministry of Economic Development and Trade and was approved in Minskostokrazvitiya. “We can use this indicator not earlier than in five years, when the projects are launched, will be launched at full capacity, and we will have the opportunity to properly assess this,” the head Minskostok noted. – It is about clearly defining at the level of the law that such benefits are provided for new jobs that arise as a result of the creation of new capacities. The corresponding bill has been prepared, conciliation proceedings on it are coming to an end, we are ready to submit it to the government of the Russian Federation within 2 weeks, ” Galushka summed up. Posted in News on 08.05.2017 by admin. 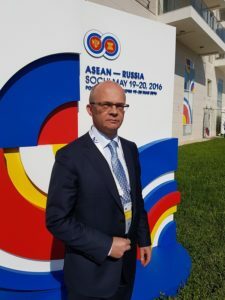 Last month the Vice-President of the public organization "Investment Russia", the head of the working group on investing in tourist and recreational facilities and cooperation with the ASEAN countries Amelin Arkady Vladimirovich visited Southeast Asia. For a little more than a year Arkady Amelin was with business visits in Thailand, Singapore and, for the third time, Indonesia. The purpose of the activity of LLC “Investment Russia” is, first of all, assistance to entrepreneurship in attracting investments to the Russian Federation. At the same time, our organization has always very sensitively captured the most relevant areas of state economic policy. One of the main political and economic trends of recent years is the “turn to the East”, the development and deepening of business cooperation between Russia and the ASEAN countries (Association of Southeast Asian Nations). It is clear that such cooperation is a two-way road, it involves the movement of goods, services and capital in both directions, as they say, at the oncoming courses. The main place in the business interaction of Investment Russia with the ASEAN countries is the development of tourism, including the development of resorts, as well as attracting investments in various projects in agriculture, energy, infrastructure, etc. It should be noted that the last year was a special year. It marked the twentieth anniversary of the Russian Federation’s cooperation with the ASEAN organization, which unites 10 countries of this region of the world with a combined population of 630 million people. The Association includes the Sultanate of Brunei Darussalam, Vietnam, Indonesia, Cambodia, Laos, Myanmar (Burma), Malaysia, Singapore, Thailand and the Philippines. Commemorating the significant date, the third anniversary Russia-ASEAN summit was held in Sochi on May 19-20, which became the largest international event on the territory of the Russian Federation in 2016. The summit was attended by the top management of each of the ten participating countries of the forum. Russia was represented by President Putin V.V., who in one day was able to meet with the head of each delegation, most often the first person of the state, and discuss the most pressing issues of bilateral cooperation. The summit was held under the general slogan “Towards a strategic partnership for the common good”. In parallel with the summit these days, in Sochi, a business forum was held, which brought together experts and businessmen from all participating countries. Representative of Investment Russia, Vice President Arkady Amelin, who participated both in the summit and in the forum, held a series of business meetings with business representatives of several ASEAN countries, which resulted in further business contacts in Russia and abroad, the signing of agreements on cooperation, and gave start to cooperation on a number of joint projects. At the moment, Investment Russia actively cooperates with Indonesia, Cambodia, the Philippines, establishes a business partnership with Singapore, Laos, Myanmar and other countries in the region. On April 13, the Round Table “Prospects for the Development of Industrial Real Estate at the Stage of Growth of Industrial Investments: State-Business Interaction” was held in «Business Russia». The event was attended by Vice-President of the All-Russian Public Organization “Investment Russia”, Head of the Joint Working Group on Foreign Investors Support, Commercial Director of Tenzor Consulting Group Sergei Orekhanov. Initiators and moderators substantive discussion on the development of industrial development in the capital region became a Department of the city of Moscow for competition policy and member of General Council of Business Russia, Business Ambassador to Spain Edward Gulian. The business event was supported by the RF CCI and “OPORA of RUSSIA”. In addition to the Department for Competition Policy, three other specialized structures of the Moscow Government took part in the round table: the Department of Science, Industrial Policy and Entrepreneurship, the Department of Economic Policy and Development – the State Agency for Management of Investments, the City Property Department. The entrepreneurial community was represented by professionals in the real estate markets, production and consulting, business associations, industry experts. The participants of the roundtable identified and discussed the problems that create obstacles to the progressive development of the production business and, as a result, the development of industrial development. And, also, suggested ways of possible solutions to these problems. Chairman of the Committee on Entrepreneurship in the real estate economy of the RF CCI Alexander Kanshin asked the relevant vector: “In the current economic conditions, business should start looking closely at the true development of industrial real estate and its most promising component – the creation of industrial parks.” Also, he dwelled on the complexities that owners of industrial parks today give: in terms of access to energy resources, it is the need to obtain loans for the development of the infrastructure of technological connection systems; In terms of tax policy – as before, a significant burden is the combination of land tax and property tax. The business ombudsman in Moscow, Mikhail Vyshegorodtsev, expressed the opinion that developers will be more actively involved in the construction of industrial real estate, if the city’s demands are discussed with them, and mutually acceptable terms for the requirements to residents are found in the dialogue, for example, to ensure the level of salaries for employees of resident companies. Also, the Business Ombudsman recalled his earlier proposals on reviving the market of land assets in Moscow. Representatives of the Government of Moscow actively participated in the discussion. Vasily Kalinkin, the head of the department for attracting and supporting investments of the Department for Competitive Politics, informed the audience about the Unified Standard of Trading, adopted in 2016, based on the principle of “one window for business”. The presentation of the Deputy Director for Strategy of the City Investment Management Agency, Vladimir Chernyavsky, “The Moscow Investment Portal: Functional for the Industrialist and the Investor” was devoted to the expansion of opportunities. Deputy Head of the Industrial Policy Department of the Department of Science, Industrial Policy and Entrepreneurship Dmitry Litvin spoke about “Regional measures to support the development of industry in the city of Moscow.” Together with the speakers on numerous questions of the professional community, Igor Ledehov, the head of the department for preparation of tenders of the Moscow City Property Department, answered. Experts of the business event were Lyubov Tsvetkova, Chairman of the Board of the Moscow Investors Association, Dmitry Lipchak, President of the Association of Real Estate Market Experts, Mikhail Shaposhnikov, Director of the Strategic Consulting Department of RealJet. They noted the systemic problem in the partnership interaction between government and business: there is a lack of continuity of decisions, which hinders the development of any business, but especially industrial one. 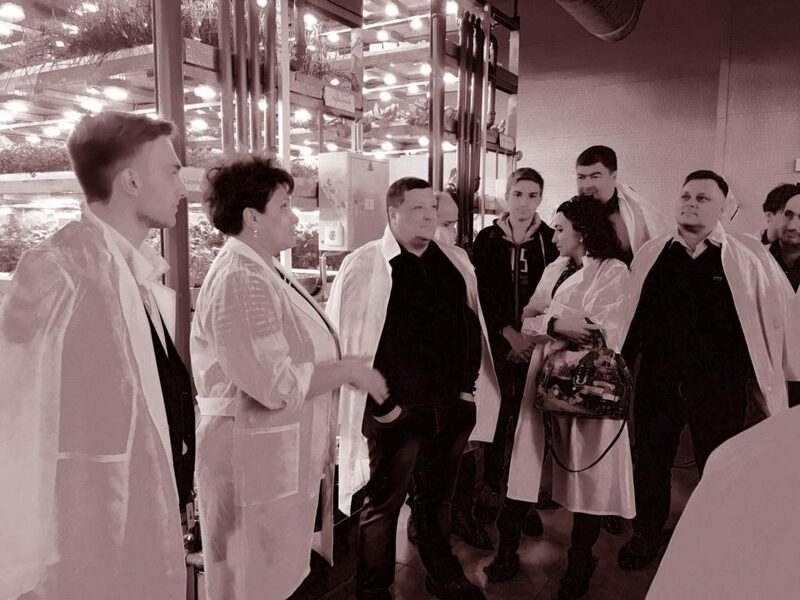 Entrepreneurs – managers of manufacturing companies from various industries, developers, consultants supported the Chairman of the RF CCI Committee, the Business Ombudsman in Moscow and experts. In particular, the member of the General Council of Business Russia, the chairman of the branch office for sports construction, Maxim Grishin said: “We forget about technology and technology in the continuity and, as a result, do not look beyond the horizons, do not plan for at least 10 years ahead”. Natalia Volkova, Deputy General Director of Orstomoda LLC, and General Director of TECHPROPLIT LLC Elena Smirnova focused on the difficulties of applying existing tax benefits: the law was adopted, but the mechanisms for its implementation are poor. Analyzing the state of the Russian industrial development, Vice-President of the Investment Promotion Company of the Russian Federation Investment Russia, Head of the Joint Working Group on Support of Foreign Investors, Sergei Orekhanov concluded: the development of industrial development is determined by the availability of benefits, which is formed, including conditions Business, which forms the power: the project will be profitable – there will be also an industrial development. In conclusion, the moderators of the round table – Member of General Council of “Business Russia”, Eduard Ghulyan and head of the Department for public relations and media prep Tatiana Semenova summarized the discussion and voiced the General solution of the need to continue the dialogue of representatives of business and government in the form of direct dialogue at the site of the round table. South Korean business was invited to Primorye. Entrepreneurs and functionaries from the Republic of Korea responded. 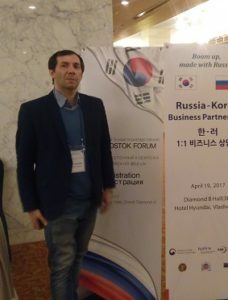 April 19, Vladivostok hosted the 7th Far Eastern Russian-Korean Forum. Representatives of the authorities, diplomats and businessmen – only 200 people discussed at the forum prospects for cooperation between the two countries – Korea and Russia. South Korean investors invited the governor of the province and stressed their initiatives here will support. – Today, like in the whole Far East, qualitative changes in the investment sphere are taking place. We have unprecedented measures to support business. Here I am referring to the areas of priority development and the Free Port of Vladivostok. These mechanisms are very in demand among investors. In Primorye, there are four territories of advanced development. They employ 32 residents. A hundred more at the Freeport of Vladivostok. 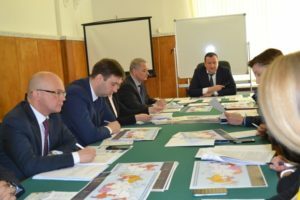 The Federal Agency for Tourism of the Russian Federation in early April hosted a series of meetings of the working group to develop a draft concept for the Federal Target Program for the Creation of Tourist Clusters on the Territory of the Russian Federation (FTP) for the period 2019-2025, in which the Vice President of “Investment Russia “, The head of the working group on investing in tourist and recreational facilities, the general director of” Dimars Group “Arkady Amelin. The current Federal target program “Development of domestic and incoming tourism in the Russian Federation (2011 – 2018)” was approved by Government Decree No. 644 of 02.08.2011 and expires next year. promotion of the tourist product of the Russian Federation in the world and domestic tourist markets. Based on the results of the Program, tangible results were achieved on the development of the Russian tourist and recreational complex, and it received a positive assessment in the government, having entered the top five most effective federal targeted programs. Thus, within the framework of the Program, 45 tourist-recreational and auto-tourist clusters are being built in 35 regions of the Russian Federation (which, as of March 1, 2017, corresponds to more than 500 tourist infrastructure objects, 212 of which are put into operation, 172 objects of the providing infrastructure, 93 of which commissioned, 29 completed construction, 50 are under construction). About 18 thousand additional jobs were created, and the number of people employed in tourism in 2015 was 596 thousand people. Out of the federal budget, about 17.666 billion rubles have been allocated for the construction of a providing infrastructure for tourist, recreational and auto tourists’ clusters. In 2017, co-financing from the state budget will amount to 3.4 billion rubles and 3.3 billion rubles in 2018. The system of public-private partnership that has developed in the implementation of FTP has contributed to increasing the attractiveness of tourism in the eyes of private investors. As a result, about 2.3 rubles of extra-budgetary investment were provided for one ruble of federal budget funds under the Program. All these measures taken by the state had a direct impact on the development of the domestic tourist complex and the growth of Russia’s popularity as an attractive tourist destination among, first of all, its own citizens. Only in the past two years domestic tourism has grown by more than 30%, giving an average annual growth for the period 2015-2016 of 18%. The internal tourist flow by the end of 2016 amounted to about 50 million people. The development of domestic tourism is of great importance for the country and is one of the tasks of import substitution, and the development of inbound tourism is one of the promising ways of solving the problem posed by the President of Russia V.V. Putin’s tasks to increase the share of non-primary exports in the country’s total exports. Today, tourism forms 3.4% of the country’s GDP, affecting 53 related industries, creating one workplace in the tourism sector entails the creation of up to 5 jobs in related industries. According to the UN World Tourism Organization (UNWTO), the Russian Federation for the first time in 2016 for the first time entered the top ten most frequently visited by tourists. The new Federal target program for the creation of tourist clusters in the territory of the Russian Federation for the period 2019-2025. Should continue the case, taking into account the experience gained and the analysis of errors. The Russian President Vladimir Putin drew attention to the miscalculations and shortcomings committed during the implementation of the FTP, on 22.11.16, at the meetings of the All-Russian Popular Front “Forum of Actions”. In particular, it was noted that local authorities often fail to fulfill their obligations to attract a contractor and a private investor to the announced project, with funds from the federal budget being spent in full. The President of the Russian Federation set the task to strengthen control over the efficiency of using funds, and also to involve representatives of public organizations more widely in the monitoring mechanisms at all stages of the Program implementation. In addition, when developing the new FTP, the task was to improve the mechanisms for interaction with investors. This is what the Deputy Head of the Federal Agency for Tourism Nikolai Korolev drew attention to, opening the meeting of the working group on drafting the concept of the Federal Target Program for the creation of tourist clusters on the territory of the Russian Federation for the period 2019-2025. With representatives of each of the 15 priority tourist destinations (destinations) of Russia. The regions were represented by the Vice President of Investment Russia, Arkady Amelin, and it was recommended that the IR and similar organizations be more widely involved in order to more successfully ensure the participation of private investors in financing projects. Amelin A.V. On behalf of OOO “Investment Russia” came to an agreement with the leadership of Rosturizma to carry out interaction on an ongoing basis. The Vice President of the Republic of Iran also held talks with representatives of a number of republics, territories and regions of Russia and reached an agreement to strengthen cooperation, including at the local, regional level. Posted in News on 02.05.2017 by admin. Chukotka is currently ready to provide about 15 million people with "Far Eastern" hectares. The head of the region Roman Kopin told about it during the briefing with journalists, reports IA Chukotka. The governor answered questions during the conference "North-East: Territory of Development", dedicated to the results of the implementation of the programs of Chukotka and Magadan for the development of the mineral resource base. It was held yesterday, April 27, in Moscow. Posted in News on 28.04.2017 by admin. A large delegation of the Chukotka Autonomous Region will participate in a joint conference with Magadan colleagues, which will be held in Moscow tomorrow, April 27. The event "North-East: Territory of Development" will be devoted to the results of the implementation of the programs of the two regions on the development of the mineral and raw materials base, reports IA Chukotka. Posted in News on 26.04.2017 by admin. The governor of the Chukotka Autonomous Region Roman Kopin announced the need for the reconstruction of the Pevek airport at a meeting of the government of the Russian Federation on the development of major investment projects for the transport infrastructure of the North of Russia in Murmansk under the chairmanship of Prime Minister Dmitry Medvedev, reports IA Chukotka referring to the press service of the regional government. Posted in News on 25.04.2017 by admin. The District Department of Finance, Economy and Property Relations in conjunction with JSC "Federal Corporation for the Development of Small and Medium-sized Entrepreneurship" invites entrepreneurs of Chukotka, as well as those who are just thinking about starting their own business, to participate in the presentation of support measures implemented by the SME Corporation, reports the publishing agency «Chukotka». Posted in News on 20.04.2017 by admin.